Gordon Pluck was born and lives in Newton. Gordon met Gilly (who was born in Wales) when stationed in Pembrokeshire and they married in 1960, living from then on in Newton. Gordon went to school in Newton until 1945 when he went to Harston for his senior years. He would bike to school and leave his bike, along with others, in a shed at the blacksmiths next to the school. He and others would cycle home to Newton for lunch and would sometimes be late if Claud Vallis shut the level crossing gate early so they had to wait on the wrong side. He remembers ‘Bub’ (Clifford) Segrave (Stuart’s brother) sometimes came to school from his farm on a donkey which he would leave in the Hutchinson family’s orchard behind the schoo l- the Hutchinsons lived in the old Victorian house that was to the north of the school (knocked down and replaced by three new houses in 1990s). Sometimes the boys would cycle down Button End to Mr Wisbey’s sandpits and watch the Sandpipers fly in and out of the holes in the sand. Gordon stayed at Harston school till he was 15 as the school leaving age had been raised from 14. ‘Daddy’ (George ) Royston was the head master, ready for retirement but kept on after the war for a while due to staff shortages. Gordon felt he was taught and learned little at that stage as Royston would get them to repeatedly read around the class ‘Tales from the Homeland’ and ‘The Golden Fleece’. Royston would appear to fall asleep at times. He had French windows opposite the school house so he could easily get home. He would get some of the boys to work on his garden, or harvest the walnuts from his tree to prevent anyone else taking them. Another time he got boys to put up his washing line. There was no school kitchen then so meals would be delivered to the school in sealed tins – Gordon didn’t know where from. Sometimes Royston would open up a tin and remove some of the meat to eat before handing it to a pupil. Apart from the Victorian buildings there was the boiler house between the Big Room and Royston’s classroom and the other buildings in the playground were toilets – one end for boys, the other for girls, with a wall behind. Gordon recalls there were no playing fields then as they were covered in glasshouses. The playing fields were added after The Paddock was developed in 1969/70. Apart from Mr Royston, there was Miss Jackson who took the infant class and Mrs Barnes who took the Seniors – 11-14 yr olds. Later on, before Royston left, Mrs Barnes’ classroom was divided into two and another classroom created between hers and Mr Royston’s and another teacher was employed. The Big room was used for woodwork and cookery. Mr Norman would come once a week to take the boys for woodwork. Once they built a wheelbarrow but it was too big to get it out through the doors. They didn’t have any proper physical education in those days – someone sometimes took them for football or cricket in The Park (Hurrell’s land). One Monday Mr Royston turned up and told the boys they were to have a football match against Haslingfield where Mr Coles was the Headmaster. Harston had no team so the boys were chosen with no preparation but did their bes t- the result being 11-0 to Haslingfield. If you could swim, you were taken occasionally to Royston to The Green Plunge but as Gordon couldn’t swim he was never allowed to go. The parents raised the money to build a school swimming pool which must have been before 1971 as it was shown on that map. Gordon remembers few evacuees as he went to Harston after the war, but does remember Freddie Hollingworth as he stayed on till 1950 so he could finish his education at the Technical College. After Gordon left school he played for the Harston 2nd football team in the late 1950s. The two football teams and two cricket teams did very well then. Bill Coad played in his team and later Bill was chairman of the Cambridgeshire Football Association until he retired in July 2014. After a while, as most of Harston’s 2nd team was largely made up of young men from Newton they decided to form their own Newton team which played in a cow field of Walston’s beyond Newton Hall. 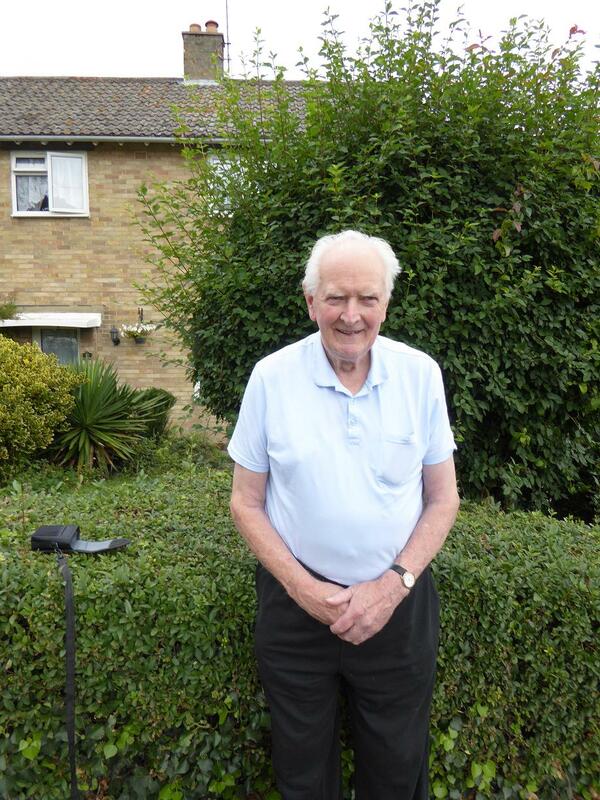 Dr Young was the local doctor in the 1940s & 50s who cycled everywhere to the surrounding villages, treating people for illnesses, taking out teeth, and once in Newton taking out a child’s tonsils while a parent held him down. He had a surgery next to the Coach and Horses and his son-in-law, Dr Webb also worked there (but lived in Barrington in a big house by the Green where you turn for Orwell.) Dr Bunn also had a surgery but he lived at Stapleford. Gordon and Gillly both remember the Railway Station being very busy; it shut in 1963. Before then it was used regularly by farmers to transport crops, especially sugar beet. In the 1970s Gordon would look after Brigadier William Hurrell’s car when he returned home from his regiment.